Deep within the rugged mountains of the Okanogan country, my team and I are on a quest to find out and document if million-dollar mines and ghost towns still exist today. Boom Towns & Relic Hunters of Northeastern Washington State is designed for use by anyone with an interest in the history of Northeastern Washington and the willingness to wander the roads of the Okanogan country in search of the traces of yesteryear. 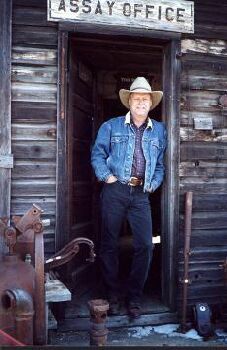 The research presented in this website gives an intriguing look back into Northeastern Washington’s gold rush days of miners, prospectors, pioneers, Native Americans, and ghost towns, focusing on the six historic mining counties of Chelan, Kittitas, Ferry, Stevens, Pend Oreille, and Okanogan, which is the largest county in Washington State. These six counties encompass some of the most irresistible and historic regions in Washington. 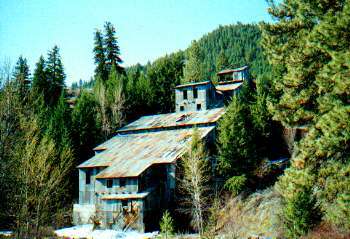 The abandoned million-dollar Alder Stamp Mill which was located southwest of Twisp-a mute reminder of the bonanza mining boom of along ago. In 2002-2003, with assistance and input from the Okanogan County Health District, the Environmental Protection Agency, and the Alder Gold & Copper Company, this historic mill was demolished and removed. 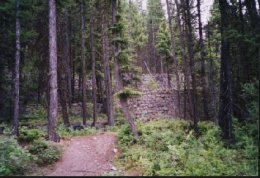 When I was a young boy, my father and I regularly came to this area to fish, hunt, and camp, and to explore ghost towns and mining camps. Ever since those early years of my childhood, the beauty and tranquility of this country have inspired me. When the history of this country caught my interests, I began to explore further and to research its miners, prospectors, pioneers, Native Americans, and old ghost towns in greater depth. I talked to local folks from around my hometown of Winthrop—some of whom had been pioneers in their younger days or were descendants of this region’s pioneers—as well as to volunteers from local historical museums in the surrounding areas. Everyone that I talked to was very knowledgeable and helpful and enjoyed sharing old stories. I searched through historical archives, read many books and old newspaper articles, and looked at hundreds of historic photos during my many years of research. Part of the mysterious “China Wall.” This wall is the largest of a group of ten walls and measures 80 feet in length and 27 feet high. So if you’re not looking to strike it rich but would like to revisit those colorful boom-town days of yesteryear and relive some of Washington’s history, excitement is just waiting for you where the land stretches out wild and free in historic Northeastern Washington State. For those of you whose history goes back far enough, I hope our website rekindles some of your memories. If you are a student developing a report for school I'm certain that you will find this site to be a wealth of information of both the past and the present of Northeastern Washington. In the end you may find yourself as captivated by this part of the state as I did as a young boy. To make your report writing easier we have developed a Ghost Town Report Outline, Click here!. Send us a copy of your report and we'll post it on the website for the world to see! Without history, there would be no heritage, and only by gathering the fading old memories of yesteryear and handing them down from generation to generation can we preserve it. A generation that ignores history has no past and no future. I encourage descendants of our late Native American and pioneer families who may have historic photos or recollections for other history buffs to enjoy and learn from to contact me and make them available for future publication. I feel that each story deserves to be told and recorded. Don't be a stranger, sign my guestbook before you leave! 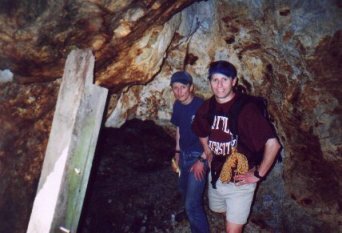 (L-R) Jim Sr. and Jim Jr. exploring the remains of the historic First Thought Mine on Ruby Hill. Boom Towns and Relic Hunters is dedicated to my father and best friend Lloyd E. Smith, 1921-1996, who enjoyed exploring the hills and valleys of Okanogan County. To our mother and grandmother, Fern Adele Pfeiffer, who has contributed so much love for her family and friends. We love you! NOTE: Boomtowns and Relic Hunters is an informational and educational website. I am not making monetary profit from the site, only the reward of sharing my fascination with the long gone history of Northeastern Washington. If any of the information on this site belongs to you and you'd rather not have it located here, please let me know and it will be removed. Where possible I have credited authors of articles and photographs. Most of the historical photographs courtesy of The Okanogan Historical Society. Should you visit these sites do so at your own risk and observe the law.